All these tiny decisions to relax and use a bit more water have added up. Statewide, Californians are using 18 percent more water than at the same time in 2017 — nearly the same amount as before the drought emergency was declared. In January, Californians used about 71 gallons per person per day. That's almost as much as the 74 gallons we were using in January 2013 -- a year before California's drought emergency was declared. In other words, we appear to be almost back to our free-wheeling attitudes about water. That trend has taken on added urgency this week — the traditional end of California's rain and snow season. State water officials use the first week of April to assess the water content in the Sierra Nevada snowpack. Runoff from melting snow provides about a third of California's freshwater for drinking and agriculture. By the end of the March, electronic sensors indicated the water content in the snowpack was less than 60 percent of average. Why did Gov. Brown declare the drought over in the first place? It has to do with the historic amount of snow that fell last year in the Sierra. On April 7, 2017, the day Brown issued an executive order calling off the drought emergency, the Sierra snowpack was 164 percent of average. Lake Oroville, the state’s largest reservoir, was completely full — so full that just two months earlier, Oroville dam operators were forced to use the emergency spillway for the first time in its 49-year history. The spillway eroded so much there was concern the dam could breech and flood the town of Oroville downstream. The six-year drought, which had left the Sierra Nevada nearly bare of snow in 2015, was clearly over. Did calling off the drought change anything on the ground? Yes! Gov. Brown’s executive order put an end to mandatory water conservation in California. Since May 2015, the State Water Resources Control Board, an agency that emerged during the drought as California water cop, had been requiring every city and water district to cut its water use by a certain amount. The Water Board relaxed those rules a little bit in May 2016, when cities just had to prove they had enough water to make it through three dry years. But after April 2017, all those requirements went away. Did we start using more water after the drought ended? Take a city like Palmdale, where water use rose 5 percent after the drought was called off compared to the same period in 2016. Palmdale allowed people to water their lawns more often, and backed off on enforcement. Other cities, like Redlands, didn’t change any of its water rules, but officials suspect their customers started to slack off because they’re hearing mixed messages about the need to conserve. 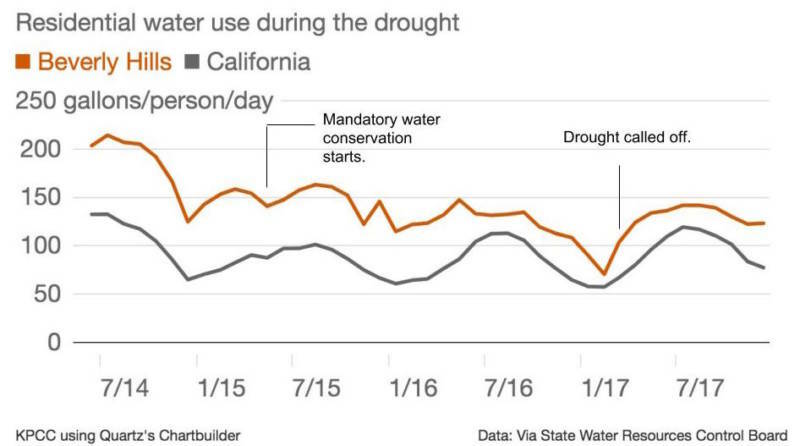 Water use during the six months following the end of the drought was up 18 percent compared to the same period in 2016. “We made the point to them that even though the state has declared the drought over, all the restrictions remain in place for Redlands customers,” said Cecilia Grado, a water resources specialist with the city of Redlands. What does the media have to do with it? Media coverage of drought may be critically important in encouraging conservation, according to a 2017 study in Science Advances. Researchers at Stanford University surveyed nine daily newspapers during two droughts, looking for stories having to do with "California drought," "water conservation" and similar terms. The first drought occurred during the Great Recession and received relatively little media coverage, where as during the second, beginning in 2012, media coverage was "extraordinarily high." They found that over a two-month period, an increase in 100 drought-related articles was associated with an 11 to 18 percent reduction in water use. But the media coverage wasn’t happening in a vacuum – reporters were covering changes in rules and regulations. But since Brown called off the drought, media coverage has also dried up. “Water issues in California have fallen off that priority list,” she said. Should we all still be cutting back on water? For Ajami, that depends on what we’re doing with the water we’re using. 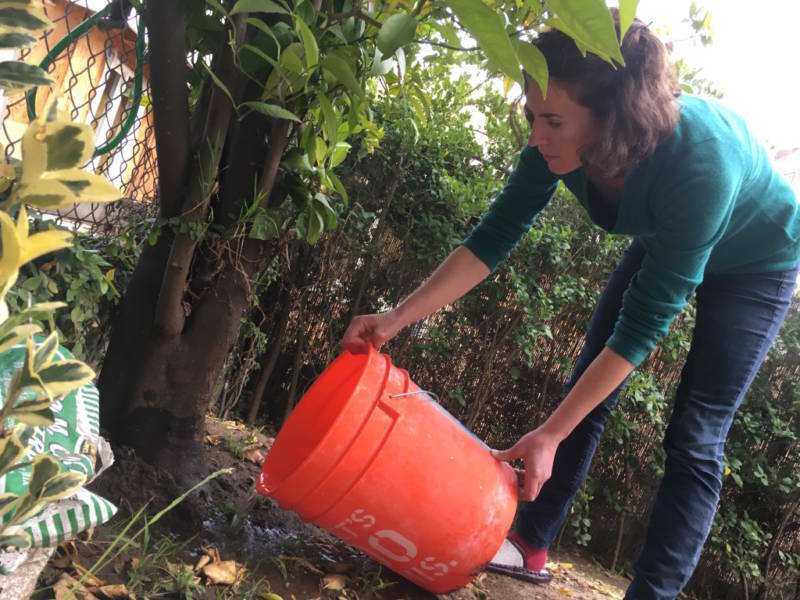 For Jelena Hartman, a senior scientist at the State Water Resources Control Board, the main challenge is to get Californians to switch from an emergency conservation mindset, with shower buckets and dead grass, into a long-term, water-saving way of life. That means replacing lawns with artificial turf or native plants, fixing leaks, ripping out old toilets and washing machines and putting in more efficient ones instead. “As a state there is a lot of work to be done to move away from those short-term emergency conservation measures to something that can be a permanent change,” she said. How can we save water in the long-term? 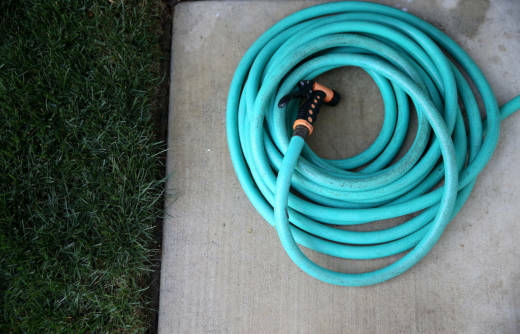 At the state level, the Water Resources Control Board is working on a proposal to permanently ban wasteful uses of water like watering your lawn until it runs into the street, washing a car without a shut-off nozzle and irrigating street medians. There are also two bills in the state legislature, AB 1668 and SB 606, that would clamp down on water use in cities by forcing them to use water more wisely. The bills would set a limit of 55 gallons per person, per day, for indoor use. But outdoor use is by far the bigger problem. More than half of all the water used in cities in California is sprinkled on lawns, flowers and ornamental trees. So the two bills would set limits on how much you can use depending on where you live. Cooler, denser cities with smaller lots and multi-family homes, like San Francisco and Santa Monica, would be required to use less water than hotter, more suburban cities with larger homes and yards like Riverside and Redlands. The State Water Board would slowly begin ratcheting up enforcement, with no fines until after the first five years of the program. What about in my city? Some cities are still doing a lot too! Places like Los Angeles and Redlands never let up on the rules and regulations they had during the drought. Others, like Santa Monica, are passing new, even more ambitious ordinances to keep water use low. Santa Monica’s new water neutrality ordinance, passed three months after Gov. Brown declared the drought over, requires new developments to use the same amount of water as the building they are replacing. Others cities are phasing in “smart meters” that read water use data in real time and allow city staff to quickly detect leaks. In Beverly Hills, water conservation manager Debby Figoni gets a list every day of the biggest water users in the city. Looking at graphs of their water use, she can tell if they've got "continuous flow issues" like leaky pipes, a broken sprinkler or a running toilet. When she calls residents to tell them about the leak, she offers them a rebate on their bill for fixing it – but only if they agree to reduce outdoor water use first. While some cities, like Los Angeles, are still offering rebates to remove grass lawns, the largest source of additional rebates, the Metropolitan Water District, has dried up. The agency is voting in April whether to resume the program. However, MWD does still offers rebates on low-flow toilets, high-efficiency washers and irrigation controllers. It may boost the amount of those incentives to encourage people to switch them out.